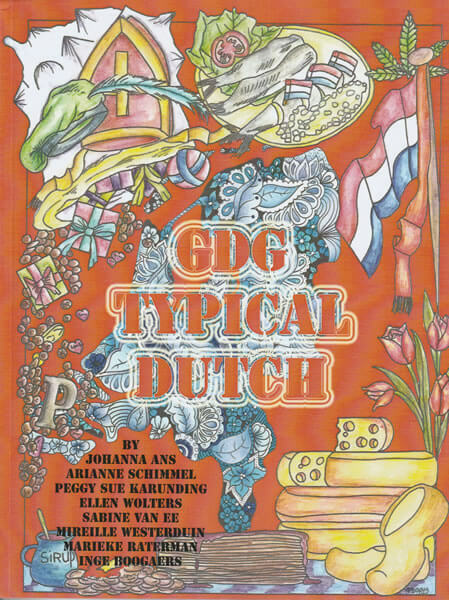 A while ago, November last year to be specific, I bought the then recently released coloring book ‘Typical Dutch’ by Global Doodle Gems. Being Dutch and living abroad you can sometimes get excited about typical Dutch things. Things that weren’t that special while I was still living in the Netherlands. I mean, a windmill… there are so many of them in the Netherlands. I’ve been in mills more than once and I bought sawdust from a sawmill for my bunnies and several types of flour from a flour mill shop to bake our own bread. Back then it was ordinary, just a mill. Wooden shoes, same thing. Every world citizen thinks of the Netherlands when they’re seeing a pair of wooden shoes. Me too. For years I’ve been running around on those things. As a child already, and later as an adult they were damn easy to hop in (and out) when you needed to do some gardening. But now that I’ve been gone for so long, I don’t feel attracted to them anymore. Wooden shoes are wooden shoes. Nothing more, nothing less. I’m not sure what exactly happened, but when Typical Dutch was published I just had to have it. Well, I do have that feeling more often with newly published coloring books hahaha, but when I finally had this one in my hands it made me feel warm inside. 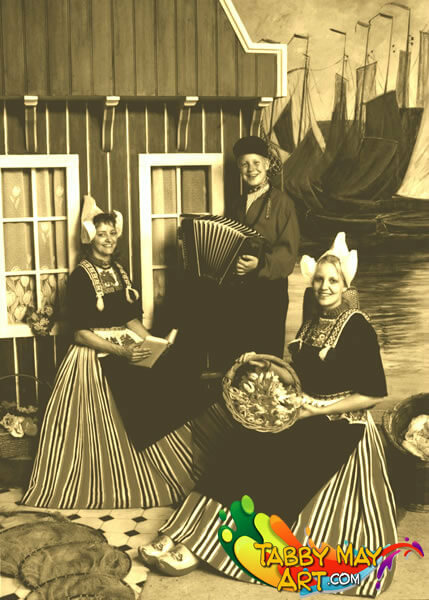 Ah great… Dutch cosiness, wooden shoes, tulips, windmills, Sinterklaas, cheese, Dutch Doughnuts, brined herring, folk costumes, it’s all in there! And then I noticed that deep down inside, no matter how far away I’ve moved and how little affection I feel for the Netherlands the way it is now, I’ll always remain Dutch. And I’m even truly from (North) Holland! For the first time in years I had the feeling that it’s okay, instead of feeling resistance and the almost childish feeling of ‘I don’t wanna be Dutch’! After our week’s stay in the Netherlands, of which I wrote a complete blog, I thought it would be nice to stay in the Dutch theme with this coloring book. In the meantime I did do some coloring in it as well and one drawing stands out for me. Even though I’m still a bit confused what exactly is the Dutch part in this drawing. It’s probably the circles, that I turned into yellow marbles. They’re probably meant to represent raindrops. Since that is very (VERY) Dutch: rain! Mireille Westerduin has made this drawing. For a change I started working with a bit more modest colors by using the Derwent Graphitint pencils. 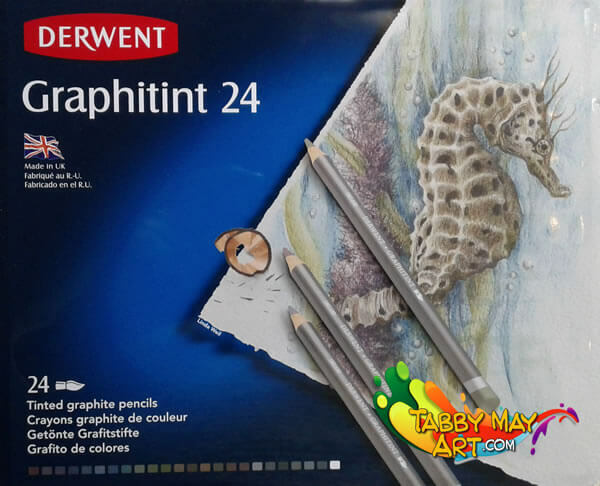 These are water-soluble pencils based on graphite. And graphite is what’s in regular drawing pencils, that grey core. The Graphitint pencils though have been pigmented, beside the graphite, which gives them warm colors with always that bit of grey in it. I myself compare them a bit with music. There are cheerful notes, in music you’d say they’re major, and they correspond with the cheerful primary colors like red, blue and yellow. And the secundary colors, that you get by mixing two of the primary colors, like orange, green and violet. Beside that, there’s also minor in music. In Dutch we say we’re feeling ‘in minor’ when we’re down or sad. Or downright cranky! Minor stands for the more sad notes and to me that corresponds with the more gloomy, dark colors and shades. And in reference to the Derwent Graphitint pencils these are real minor colors. Which definitely isn’t a negative thing! First of all I love music in minor. Even as a kid, when I learned to play the guitar, I loved songs with minor chords. And still today I often like songs in minor, they tend to be melancholy… I love it. Usually. And with color it’s the same. The gloomy looking Graphitint colors give a bit of class and style to a drawing. A twist of modesty that appeals to me a lot. So I started coloring in the flowers in this drawing with the Graphitint pencils and a water brush. Because it wasn’t my intention for this drawing to have a sad appearance, I decided that I wanted something cheerful in it. But what? The color yellow came to my mind. But how and where? I’ve been watching the drawing for a while and then I figured it might be nice to turn all those circles into marbles. With a bit of shine in it by using a white Posca marker and a bit of shadow it should work. Since I was already working with the water brush and Derwent pencils, I grabbed my Derwent Inktense pencils along. 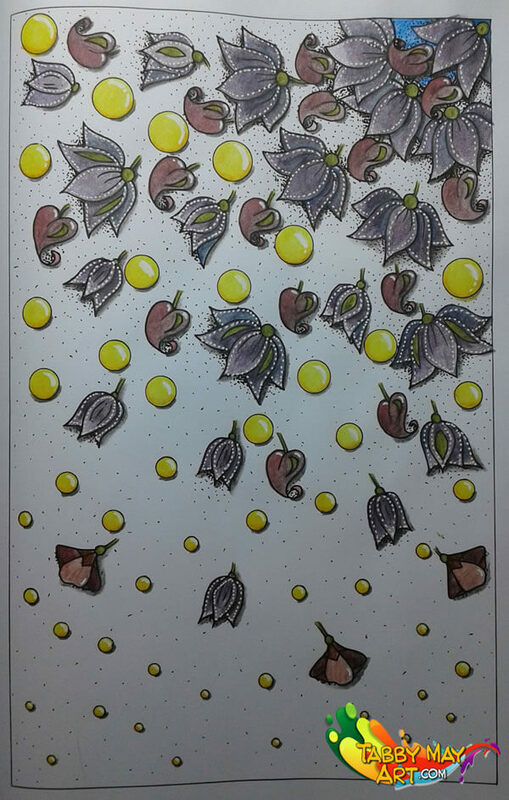 I took a bright yellow out for the marbles, an orange for a bit of shadow on the lower edge and I used the black Graphitint for the drop shadow below the marbles. Derwent Inktense pencils, it’s already in the name, give very intense colors. And even though they’re water-soluble, they’re definitely not watercolor pencils, since the core is ink-based. This means the colors are waterproof when they’ve dried, but you can go over them afterwards with other colors, or even other materials. Watch out for your clothes, because since they’re ink-based, stains are permanent and not washable! After I had colored all marbles and provided them with a bit of a ‘shine’ with the white Posca marker, I’ve given all the petals dotted lines. Also with the white Posca. And I gave the heart-shaped leaves a shiny accent as well. That brightens it just a little bit extra. Then it was time for the background. I wanted to do something with it. Something with a gradient from dark to light seemed appropriate for this drawing. I had been working with two types of Derwent pencils thus far, so I thought it to be logical to do the background with Derwent as well. Because I do have a third kind of pencil by Derwent, the Coloursoft. These are pretty soft pencils. In my opinion they’re slightly harder than the Prismacolor Premier Soft Core pencils, but they certainly color just as nice. So I picked three shades of blue and the lightest grey and started working. Layer after layer I’ve added the colors, blending the colors together with even more layers for the gradient effect. And then, all of a sudden, I had finished. My gut feeling was ‘it’s done’ and I didn’t change a thing after that. I’m really happy with the outcome of this coloring and I’ve had a lot of fun while coloring this drawing! The combination of the drawing and the used materials really felt like a coloring party to me. Obviously there are a lot more drawings in the book. I’ve made a second video in which I show you the drawings of Typical Dutch by flipping through it. You can watch this video below. I’ve also colored a second drawing from Typical Dutch, a beautiful bunch of tulips drawn by Johanna Ans. But I’ve put the pictures I took from this one (including a couple of work in progress pictures of both drawings, marbles and tulips) in a photo album. You can watch them all here! Have you become excited about this coloring book? Then you can order it here through Bookdepository (prices vary here, depending on your location, so click the link to see the actual price) or here through Booklaunch or you can click the picture or the link below. Go to the related photo album here where you’ll find several w.i.p. pictures of the designs that I’ve colored, plus an extra Dutch bonus picture. So check it out! By the way, at Booklaunch a link to this review as well as my two videos have been shared on the Typical Dutch page. That’s just so awesome! Thanks to Johanna Ans. Previous: Vacation, new coloring stuff… but how to get it home? A travelogue! Next: Doodling for beginners. Can or can’t I do it? Erg leuk om te lezen! Dank je wel voor je uitleg over de Graphitint! Graag gedaan, fijn dat je er iets aan hebt! Wat leest dit weer heerlijk weg Tabitha…superleuk…als je daar nog niet enthousiast van wordt!!! Wat leuk om te lezen, heb gelachen om de typische ” Nederlandse, Hollandse ” dingen. Ook een duidelijke uitleg over de gebruikte materialen. Hi, my name is Tabby May, I’m a musician and visual artist. In 2015 I started coloring. Meanwhile, that has extended to painting, art journaling and so much more. I work with a huge diversity of art supplies. With this website I’d like to inspire you to explore your own creativity. It gives you much satisfaction when you’re making beautiful things! 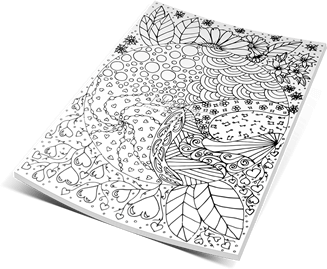 Subscribe now to my VMAF list and get your free coloring page! Please fill in your first name + best e-mail address and hit the button below.